The angry man of jazz, Charles Mingus, famously said, “Making the simple complicated is commonplace; making the complicated simple, awesomely simple, that’s creativity.” A saying which, I think, is rather befitting to watches with a GMT or dual time zone complication. Because, let’s face it, having to calculate the time in another time zone can be a complex task, especially as you stumble through an airport in a jetlag-induced haze. With Hublot’s latest Big Bang, the Unico GMT, what was already a simple solution to a complex problem has been made veritable child’s play with the push of a button. 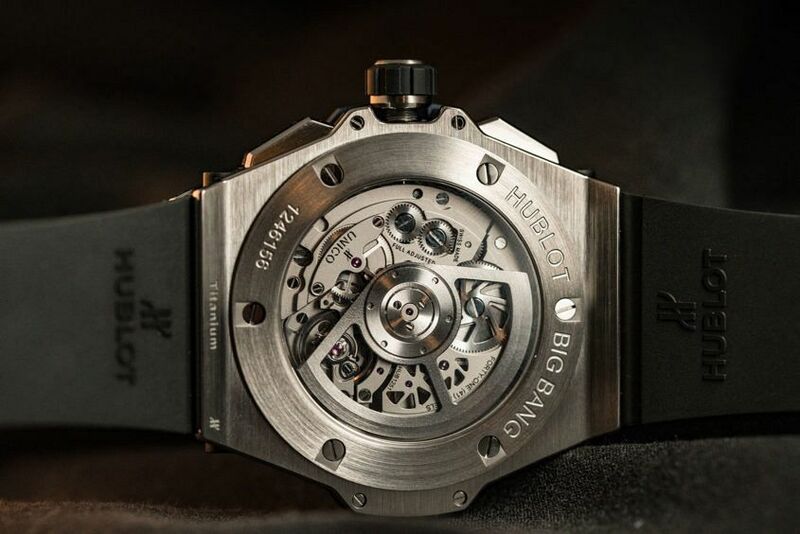 The added simplicity is thanks to the integrated proprietary module within the three-day Hublot Unico Cal. HUB1251 movement, which enables a second time zone – tracked by the conventional hour hand – to be instantly and independently adjusted in one-hour increments. This is done by operating the pushers at two and four o’clock, which adjust the hand forward or backward respectively. 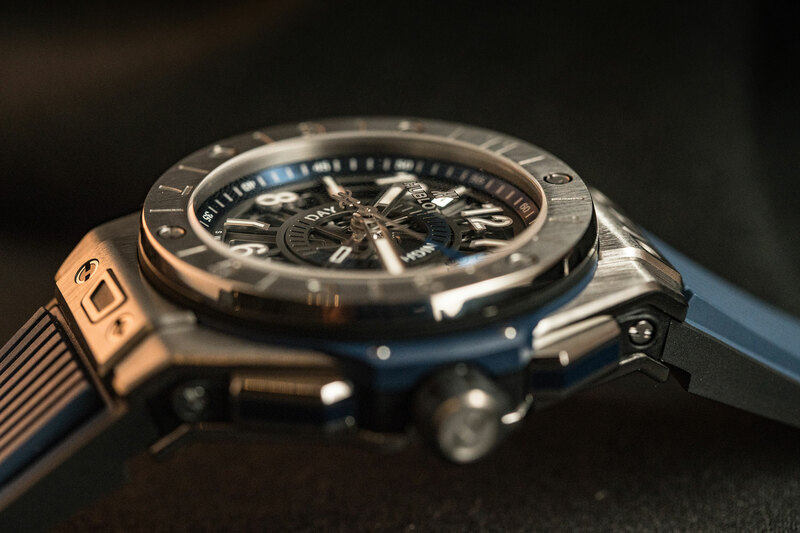 These push-buttons are also fitted with a safety mechanism to prevent simultaneous operation, and their rectangular shape – reminiscent to that of the early Big Bang models – help distinguish the Unico GMT from the chronographs. 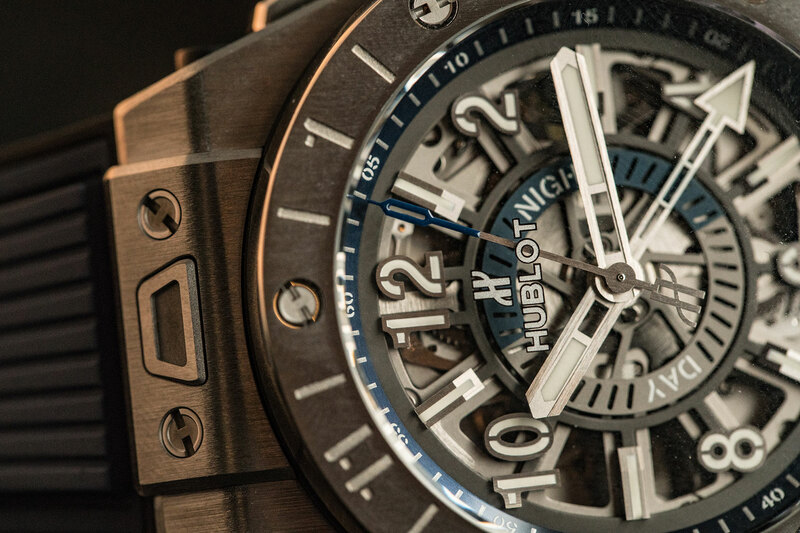 Of course, being a Big Bang, the dial is openworked and has large Arabic numeral hour markers, which – unique to this model – alternate from dial to bezel. Home time is indicated by an arrow-shaped fourth hand and, along with the conventional minute hand, is set using the crown. However, traditionalists will declare that this is not true GMT, as both times are displayed in a 12-hour format rather than the conventional 24-hour, but, to discern whether it is AM or PM at home, the fourth hand works in tandem with a circular day/night indicator in the centre of the dial. 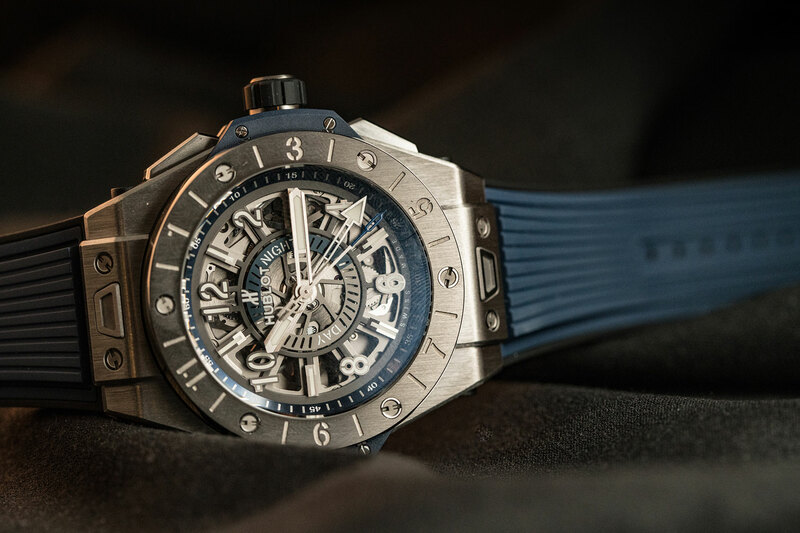 With 100 metres of water resistance, the 15.85mm-thick case of the Unico GMT measures 45mm across, and is available in both titanium and carbon fibre – in true Hublot style – and is equipped with the ingenious ‘One Click’ interchangeable strap system to secure its ribbed black-and-blue natural-rubber strap. Beneath its mechanically elaborate exterior, this travel-friendly Big Bang Unico GMT is awesomely simple. Hublot Big Bang Unico GMT in titanium, $25,700, in carbon fibre, $29,700.